Sir Isaac Newton lived during the 1600’s. Like all scientists, he made observations about the world around him. He discoverd three laws of motion. He made three laws of motion. The 3rd law of motion is, Newtons law of action reaction states that forces occur in equal but opposite pairs. 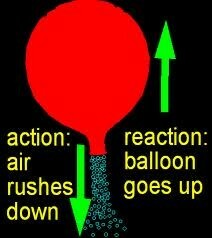 When you blow up a boloon and then let it go its going to go up but push down their for it is called an equal but opposute pair. You can also see this in a a rocket or NASA ot will go up but gases from the fule pull down. You can see this in our every day lives like perhaps you set a book on a table force of attraction between book and earth , and reaction force of the table on the book.